My first response is that Vladimir’s premise isn’t quite right: after all, the jack jumper stinging me above is from temperate, not tropical, Australia, and some of the boreal Myrmica do sting. But the general pattern holds: most of the stinging ants are tropical, and we are much more likely to be stung by an ant in warmer climates than in cold ones. I have some thoughts on this observation (related to an old post of mine), including the notion that this may be one of those ultimately unknowable deep evolutionary puzzles, but before I launch into it I’d like to hear your opinions. What do you think? Why do more ants sting in the tropics? – less biological competition and more environmental effects and catastrophic events in the temperate to boreal means more energy must be spent on strategies to counter environmental effects / change. I have a sense that the question revolves around defense. One question along these lines is: Are tropical ants more likely to be pestered by vertebrates than in the temperate zones? How about a question of dominant lineages: are formicines and dolichoderines relatively more abundant (or perhaps diverse) than ponerines (for example) in the temperate zones? A general question: what proportion of myrmicine species have vertebrate-effective stings, versus arthropod-specific stings or (spatulate) “applicators”? I recall reading somewhere (don’t remember the source) that stinging ants tend to have abdominal tergites fused to the sternites, making sting-weilding more effective, but limiting their ability to store food and water. Ants with unfused tergites and sternites can expand their abdomens to increase storage (taken to the extreme in honeypots). It seems reasonable that food storage would become more important the farther you move form the equator. more specialization (defense, predation, etc) geared toward the tropics as opposed to generalists in temperate latitudes? I think that much of it (though not all) can simply be attributed to the tropics harboring more ant diversity, including more large, easily noticed ponerines, myrmeciines, pseudomyrmecines, Paraponera, and other ants that have a painful sting, in addition to formicines and dolichoderines that are already common across many latitudes. In most of North America there are fewer species of native Ponerinae and Pseudomyrmicinae, for instance, especially compared to the Myrmicinae, Formicinae, and Dolichoderinae, and they are also smaller and somewhat harder to find unless you really go out of your way. My thought as well – if there are more species, there is a higher chance happening upon a species with a really nasty sting. Much of the “exotic” biology in the tropics is most likely just a stochastic thing. Its easy to forget just how many “boring” ie generalist, species there are in the tropics. I like to keep away from the usual “more complexity in tropics” explanation, are there even any formal proof/suggestive evidence of that? Same goes for “more competition/niches in the tropics”. This effect carries over into wildlife in general, not just ants. Stinging and venomous animals in general seem to get rare as the winters get colder. Anecdotally, up here in the Upper Peninsula of Michigan, we have zero venomous snakes, no stinging ants that I’m aware of, and the most plentiful stinging things I encounter are my honeybees (which are imports). 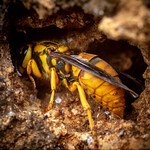 The native bumblebees can sting but mostly don’t, and the most aggressive stingers are European Paper Wasps (non-native), Yellowjackets, and Bald-Faced Hornets. Interesting, but a counter to that would be my home turf – Sweden. We have those imports, natively, atleast Vespula sp. etc, and vipers (not deadly, but bad enough to worry about) long north past the polar circle. But you might have a valid point, poisons are metabolically expensive. 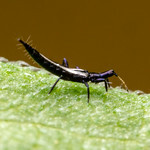 I would first have to be convinced that the pattern is real–not that there are more stinging ants in the tropics (with 400 species in a Panama lowland forest vs. 1 or 2 above the arctic circle you will have more stinging ants in the tropics), but that the fraction of ants that use a sting varies latitudinally. Also, by sting do you mean the act of stinging a human, stinging a prey, or using the sting equipment? Monomorium use theirs to produce a chemical mace; Crematogaster use theirs as an applicator. It’s all in the details. That said, the prevalence of stings in the tropics exists so that tropical myrmecologists can boast. I’m tempted to say “best expanding on the question yet” to this, Mike. However, it does seem that stings that work on large vertebrates such as ourselves are more prevalent in tropical settings, and I think the lineage representation has a lot to do with it. A corollary question is whether non-stinging ants that are blatantly aggressive against vertebrates are relatively more abundant in the tropics? If we narrow it down to arboreals, such as Azteca & Oecophylla, certainly so. But generally? Any thoughts on that? The key problem with most/all answers to this kind of question is – how could we *test* the various hypotheses not only against each other, but, as Mike Kaspari points out, against the null hypothesis that there is no pattern. Great discussion, folks! Having worked in Arkansas and the Philippines, I’ve wondered the same thing as Vladimir, having had Aphaenogaster ants run over my arms just like Anoplolepis gracilipes and never getting stung. What bugs me (pun intended) is, why there are so many stingless bee species in the Philippines, or perhaps the tropics altogether? If stings are important for success, why are there successful social insects that don’t sting? Btw, I’ve seen Trigonula bees wipe out weak Apis cerana and A. mellifera hives. Wow, what a great discussion! Thanks! Just two notes: (1) Lack of stinging ants at high latitudes seems to be mostly a Northern Hemisphere thing. Argentine fire ants and many other stinging species in S America and Australia are not tropical. (2) Many Boreal ants (i. e. Formica rufa) suffer heavy losses from vertebrate predation and colony destruction. I think it’s safe to say fire ants are mostly tropical, with a few that extend into subtropical climes. They disappear completely from the really cold places in south america, with the exception of the poorly studied, high-altitude Andean Solenopsis weyrauchi. The latter’s physiology and behavior with regard to venoom and stinging might provide an interesting test of some of the ideas presented here. My pet hypothesis about tropical species (in general not just ants) investing more into chemical defences (if this is in fact a real trend) is that it has something to do with K-selection and ecosystem stability. I don’t think it has anything to do with ecosystem productivity. High latitude marine ecosystems are more productive in general. However there are more highly toxic marine species in tropical and subtropical latitudes (cone shells, blue ringed octopuses, stone fish, sting rays, box jellyfish, etc). In terrestrial ecosystems the productivity trend is reversed but if we look at warm low-productivity systems like warm deserts (as in N. Australia) there are still more species with elaborate defenses than in more productive temperate habitats. I think this is a killer for the productivity/toxicity correlation. I would tend to think of chemical defenses (and perhaps chemical offenses as well to a lesser degree) as a more K-selected trait. Stable ecosystems tend to favour K-selected life history strategies while fluctuating ecoysystems tend to favour r selected traits (whether a system is stable or fluctuating is scale dependent so some may be stable from the perspective of a short lived species but highly variable to a short lived species). Tropical reefs, tropical deserts, and tropical forests are all stable systems. If I were to test this I would try to separate out the effects of productivity from latitude and both of these from temperature. I would also predict that shorter lived species would show a stronger correlation between seasonality and r-selected traits and a negative correlation with K selected traits. I wonder if this is a true pattern? We don’t have many ants here in Alberta compared to the tropics, and the most annoying ones are Formica, but we have lots of little soil-litter ants that have stings. I know ants get their own family and all, but (apparently unlike Michigan) we certainly have a diversity of other Vespoidea and they all have stings and seem to have no problem stinging vertebrates when they need to. I think the ‘problem’ (definitely not the right word) is that we here in a real boreal land don’t have large ants with stingers. If there is an actual difference between the proportion of ants with stings here compare to, e.g northern Queensland, then I suspect it has more to do with stochastic factors such as the distribution of lineages with stings. By-the-way – we have lots more Bombus species here than in the tropics, and contrary to some rumours, they sting and hurt like hell, even if you were just trying to save one from drowning. I think BioBob is correct – environmental selective pressure has produced adaptations to cold and warm cycles in temperate zones, whereas selective pressure in tropical zones tends to be competition between species (there’s no large changes in environment). I may be wrong but aren’t ants related to wasps and bees? Then isn’t it likely that all ants had stings, and that as ants moved into temperate areas they lost the ability to sting as food storage over winter became the top priority? Salty Sid suggested above that the ability to store food is inversely proportional to the ability to sting – so the ants HAD to lose their stings in order to survive the winters? As already noted, there are a large number of stinging ants in temperate Australia, mostly various species of bull ants (Myrmecia), of which there are nearly 100 species. Among these, the Jack Jumper Ant (Myrmecia pilosula) is the most dangerous, although also one of the smaller species. There are other (less dangerous) jumper ants within Myrmecia, such as Myrmecia nigrocincta. The ant stinging Alex is probably not a Jack Jumper Ant as these invariably have yellow-orange mandibles (& legs & antennae), although it looks to be a type of Myrmecia – beautiful photo by the way! JJA stings are excruciating and leave a wheal that can last weeks. They also cause severe allergic reactions and even anaphylactic shock in 2-3% of victims.